From ancient times to the present, snakes have been looked at with disgust, as a harbinger of bad luck. Indiana Jones certainly showed his repulsion for snakes from the very beginning. We all know the trouble the serpent caused Adam and Eve. Everyone always wants to kill snakes, when in reality, they just want to be left alone and can be very helpful to the environment. The snake is really quite incredible, though I must admit I have no love lost for them, as undoubtedly my neighbors testify to my shrieks from several streets away when they slither across my path. Did you know scientific studies have been conducted to demonstrate that a part of our brain and consciousness senses a snake before we visually see it? Thank God for that! 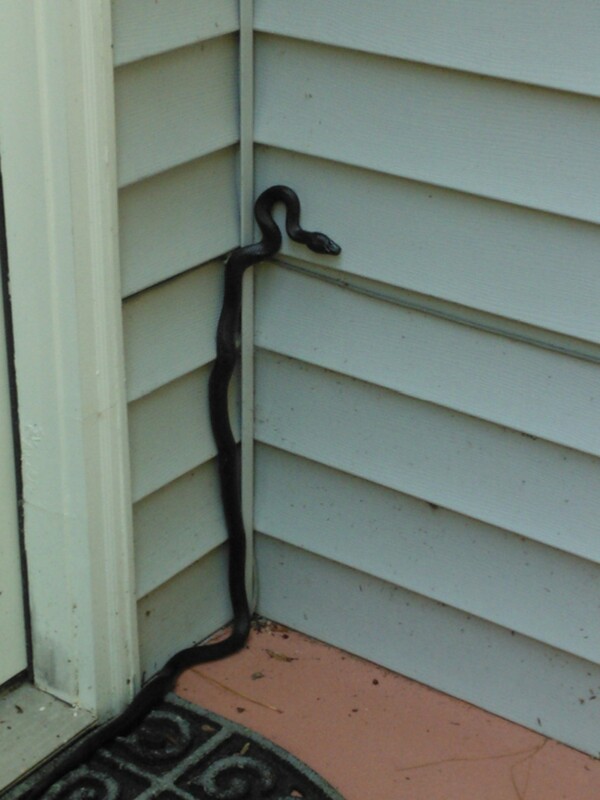 I’m researching snakes because in the last two days, two large black snakes have crossed my path. Both were large. 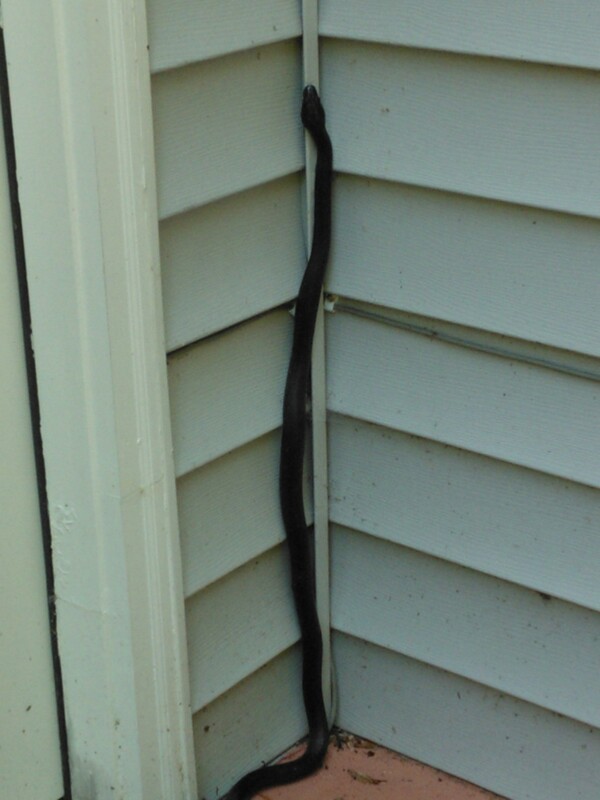 One was a black Carolina racer (the constrictor kind) and the other a harmless black snake who glided past my garden door and into the woods with gentle, nudging spray from my garden hose (after the neighbors heard the shriek, of course). A long time ago, I shared a story about a client of mine who lived symbiotically with a 7 ft. black snake named “Frank.” She loved Frank and let him go anywhere he wanted in her house, because he took care of the rodents and other undesirables. Then she added that Frank was far less trouble than her ex-husband and far more pleasant! Some snakes can live up to 30 years. The ancient Greeks and Romans believed snakes to be healers. To this day, two entwined snakes are on the medical Caduceus. Native Americans and other cultures believe snakes can bring transformation and healing. They also believe they are protectors. And what thanks did I get? I found another snake today, who also slithered right beside me and left me completely alone. I offered him the very same courtesy, after jumping several feet in the air. Snakes are everywhere this time of year. Think twice before killing them because many species are beneficial! TIP FOR THE DAY: Be careful if cleaning out an estate, attics, garages, outdoor barns and sheds, etc. Be especially careful if reaching under piles of stuff in these environments. Always wear blue jeans, boots, and heavy gloves! In every home, in every estate of a deceased loved one, there are items we have to deal with that don’t seem to have a place with us anymore. Perhaps they are no longer useful, or the sentiment has worn off. Maybe there are so many items, there’s no way you can take them all! After the family comes in and takes what they want, and some of the items have been sold or given away, there are always leftovers that can’t find a home. Old photos and slides no one wants. Brittle college diplomas and certificates from the early twentieth century. Ancient textbooks on everything from WWI nursing to social etiquette to typewriter maintenance. Old tax returns that need to be shredded and magazines and catalogs that weigh a ton. Old TV parts, metal bits and pieces, broken appliances that are stuck up in the attic. Prescription meds, record albums, small appliances, old computer printers and fax machines. Optimally, these items should have been dealt with a long time ago so it doesn’t put the family in a crisis mode when the time comes. Old appliances and computers can be recycled, as can the endless paper piles we find. Metal can be scrapped; $100 is better than hauling it to the trash, right? Prescription medications need to be dissolved in vinegar before flushed to neutralize the meds, or better yet, dissolve them and place them in a container with old coffee grounds or kitty litter. These items should be disposed of properly, but it makes us feel guilty when we are throwing away things like old photos or slides. After all, who has time to go through 10,000 slides from the 1950’s? Let me share a quick story. I used to be one who didn’t have time to go through all the family slides … until mom died. I brought the slides home and at night while watching TV, I used a little light-up viewer I bought on Ebay to see which ones we wanted to keep. I found a gold mine! Photos of dad on his ship in the Navy, mom and dad’s engagement in 1953, early baby photos of me and my brother never seen before, photos of all the kids and cousins from long ago. I had these selected slides made into prints and distributed them to family members. The thank you letters, emails, and phone calls came pouring in. It was like they each won a small lottery and were most appreciative to have these never-before-seen photos. In my case, it was worth the effort. If family does not claim these items, or there is no family left, sadly, these items either need to be discarded, donated, shredded. And it’s okay to do that — you have permission to do that. If no one else wants them or needs them, let them go with respect. It’s always an eye-opening experience working in estates after the children have taken what they want and allow us to handle the remainder. You just never know what you will find left behind. Sometimes, we just find what you would expect, the items that should have been discarded 40 years ago – broken items from the attic, old appliances, clothing that needs to be donated, etc. Other times, we find items that have value and we arrange to have them sold for the family. And on occasion, we find items that leave us scratching our heads, or items that we can never speak of and promise to take that information to our graves. We see it all: the love, the fights, the estrangements, the addictions, the sorrows, the secrets – all of which are carried through our lifetimes. It is difficult to put into words when you find war medals of courage and valor left on the floor for disposal, or antique photos of people in the family that have been left in a pile for us to discard. But we understand that every person has a story and we are not privy to their upbringing or lives, and therefore do not understand why they made the decisions they did. Recently we found letters dating from the Civil War period, of a soldier who wrote home to his sister. He wrote of the horrible conditions, how most of his comrades had died from dysentery, and that there wasn’t enough food to keep the soldiers strong. He spoke of having no warmth through the winter months, but described it in such a way that he was not complaining. It was fascinating to hear of life so long ago from a person who lived during those times, but the family took no interest. Other things we find are scrapbooks, war letters between mom and dad, family Bibles with genealogy information inside the front cover, diaries, estate jewelry, guns, etc. I guess it’s true what they say. Beauty really is in the eye of the beholder, and one cannot predict what is in a person’s heart during such difficult times. The trouble is … “one day” never comes! It’s fascinating what we professionals notice in our clients’ estates. For example, we do see a distinct similarity in almost all of the estates we go into, especially if the estate belonged to an elderly loved one from the Depression Era. The attics are usually full and the interesting thing is that 85% of them are full of things that really should have been disposed of 30+ years ago. By the time we get into these attics to clear them out, the books are rotted and have been gnawed on, anything cardboard has pretty much disintegrated, clothing either smells like mildew or falls apart in your hands, or you find items that have long since been obsolete and no one has any use for them. If items of value were stored in the attic (which is a big no-no), chances are pretty good they have been damaged and the value greatly diminished. This is not always the case, but is generally what we find. So true. Time stops for no man and it does move rather quickly. We all have the best intentions of cleaning out the shed, garage, closets, cupboards … but if you continue to procrastinate and something happens where you or your loved one become incapacitated, it truly leaves a burden for the ones you leave behind. A bigger burden than you realize. If you have had your sights on a project around the house which includes clearing out some “stuff,” make sure you know what it is worth before you sell it or give it away. It is better to clear out the clutter now so you can feel better about it and not worry. Believe me, your loved ones will really appreciate it one day. After cleaning out estates for almost 20 years, my assistant and I have a saying I’d like to share: “People shouldn’t put stuff in attics. They’re young when they put it up there, and when they finally think about cleaning it out, they are too old.” Somewhat comical, it holds a ring of truth as well. I’ve seen so many attics in my lifetime; I can predict with 98% accuracy what’s up there and the position it is placed in! It’s pretty amazing to consider that the majority of people you know have full attics. What’s even more amazing is that 90% of what is in the attic is no longer usable; it can’t even be donated anymore because it has passed its’ expiration date! Some people store clothing, floral arrangements, cardboard boxes they think they will use again, lawn furniture, electronics that for whatever reason no longer performed well, or they were broken altogether. So I must ask the question, “If they didn’t work then, why were they stored in the attic for 40 years?” Why weren’t they just discarded to begin with? Herein lies one difference between the generations. The younger Boomers, Generation X and Y, do not want clutter or anything that is considered garbage laying around the house. It simply doesn’t belong there if it can’t be used or enjoyed. Your attic is a breeding ground for critters: furry, slithery, creepy-crawly, and little un-named things in the dark that gnaw and poop, often at the same time. Clothing get eaten or rot, any kind of plastic will become brittle, dolls’ faces decompose, quilts disintegrate, old trains rust, furs fall apart, cardboard flakes in your hands, and old electronics that were obsolete then are still obsolete. Let’s not forget the smell!! You know the smell I am referring to — that mildewy, mold-like stench that refuses to dissipate and only irritates your respiratory system from the moment you step into the attic. I believe the original intent of attics was simply to hold things like luggage and some Christmas decorations. But if the hundreds, maybe thousands of attics I have stepped into are any indication, we treat them as another home that simply holds things we are too tired to deal with. So we keep stuffing it up there, where no one goes to look. You know the old saying: “Out of sight, out of mind.” That might be so … until you pass away and your loved ones need to empty it in the midst of grieving. Use the Estate Lady’s rule of thumb: If you haven’t used it, haven’t seen it, or had no need for it in 6 – 12 months, let go of it! It will only be a burden to someone else one day!